By Dandi Daley Mackall, Lori Walburg, Chris Auer is a beautiful new treasury that would make a beautiful gift for any child at Eastertime. 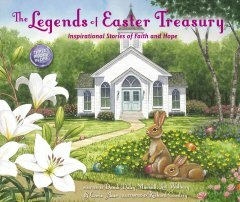 This full color treasury features three complete stand alone stories: The Easter Egg, The Legend of the Easter Robin and The Legend of the Sand Dollar. The bright, detailed art sets this quality hardcover book from other story books. The traditional art will appeal to parents and grandparents alike, as they reminisce to an earlier time period of traditional values. The only thing to consider s that multicultural families and families of other ethnicities may feel alienated by the art that depicts exclusively depicts fair skinned, blond, blue eyed children and their families. Before any reader takes offense, I simply state this as an objective observation. While many readers will not find offence at seeing art featuring fair skinned children with light hair, in this modern multicultural society, its worth a mention because those who order this book online may not have the opportunity to see the interior art as the picturesque cover depicting a serene spring view of a church gives little hint to the art inside. If you take a look at the back cover, there is a depiction of the three individual covers for each of the stories which reflects a sampling of the art. In this modern society, the publishers may wish to consider art work to feature a more multicultural perspective to reflect the multicultural makeup of today's society. As a blogger I received a copy of this book for the purpose of writing this review. The new NKJV Faithlife Study bible combines the study features of a study bible together with computer generated graphics as well as articles and notes. This bible is different in its focus from other themed bibles- it is more general, applying to daily modern life and topics. The computer generated images and diagrams offer information in a visual format. Unlike traditional photographs, these unique diagrams bring bible concepts as well as architecture to life. This is an eye opening bible for all bible readers- from beginners to advanced readers. Unlike the glossy finish of other full color bibles, the paper has a thin matte finish and curls slightly after contact with my fingerprints, after use. I found the color graphics, diagrams and maps to be more subdued, muted colors than I expected. With the exception of a few impressive graphs found in Genesis: the diagrams of the ark and the graphic depiction of the creation of the world, the colors are not bold or bright, but rather a softer set of colors- almost similar to the effect of pastels. The coloring and detail of maps at the end of the bible are created using softer colors as well. This gives the maps a washed out look. There are some photos of archaeological finds including ancient coins. There are not truly in full color but appear to contain spot color- black and white with blue tones. I am still pleased with this bible overall and intend to use it as my primary study bible. However, I found the graphics overall to be more subdued and the maps to have a washed out appearance than the other full color study bibles I have had the opportunity to review. The only change I would make with this bible would be to include more graphic features and photos. While it is true that this is a full color bible- it still is mostly text based with minimal spot color. Whether you are looking for your first bible, or if you want to upgrade to a brand new bible, you will not be disappointed with this choice. As advertised, this is the perfect bible for any curious reader. Be ready with your questions as this bible will certainly provide answers and enlightening insight. As a blogger for booklook, I received a copy of this bible published by Zondervan for the purpose of writing this review. The Woman's Study Bible, NIV - Receiving God's Truth for Balance, Hope, and Transformation - is a beautiful combination of a study bible and devotional bible. This bible was first published as a NKJV. I had been waiting for the NIV version- which has just been published. This bible features a sturdy printed hardcover, full color graphic elements as well as an easy to read font. This well made bible is sure to become any woman's favorite bible. 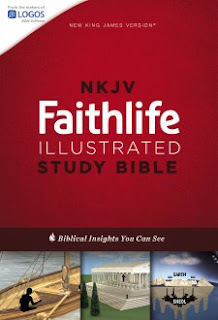 For any reader who enjoys the NIV version of the bible- this will be one bible that can stand the test of time with its study features, articles and devotionals themed for women. This bible is the perfect way to encourage bible reading. For those looking for a bible to last a lifetime, it will be a good investment or it would make a great gift. The price may be prohibitive for most readers. Unlike other devotional bibles this is more flexible as it is not based on a 365 day year. There are articles and quotes throughout but not too many to distract from the bible text. I Like the larger sized text which makes it easier to read than the smaller harder to read "standard text" of most NIV bibles. I feel the easy to read text size and font will encourage daily reading more than anything else. This hybrid bible also features study notes, graphs and detailed full color maps as well. 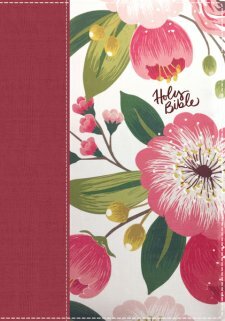 It is the perfect blend between a women's study bible with a traditional study bible . As a blogger for booklook bloggers I received a copy of this bible for the purpose of writing this review.